What is off page SEO? Many new bloggers create a good blog/website with high quality content, and best and clean template, user friendly, and original content. But many bloggers aren't reaching to get high traffic, because new bloggers can't any ideas or techniques to get off page traffic SEO. 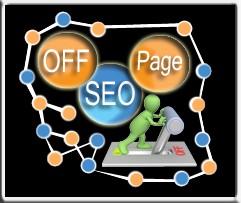 Today I am telling you about off page SEO tips. Search engine optimization (SEO) applies at two main categories. How To Make Money Online ...:::: Earn Methods ::::... Many things you apply to your blog/website, to promote your "blog" content and high your off page traffic. In this section you make your blog/website, write quality content, use SEO friendly theme or template, description of your blog, and make your blog clean of any error. And your blog is use friendly also. Today I am telling you some basic tips for effective off page SEO. Promote your blog/website content to social media sites, like a Twitter. Facebook, Google Plus, Linkedin, etc. but you just promote your content, product brand, to social bookmarking sites. But don't force social media users to go to your site and click on any ads. Because Google sees your blog/website traffic and Google don't like this. This topic very helpful to your blog traffic. You search lots of directories on the internet that accept articles many things on every topic you like. And you submit articles and get hundreds of visitors to your blog. You also use Directory submission to get traffic and increase blog rank on search engines. And send your (blog/website) RSS Feed, links, to higher your page rank and traffic. How To Make Money Online ...:::: Earn Methods ::::... This is the one of the good source to higher your traffic, and page rank. If you are a professional blogger, you must do that. Because search engine traffic are very costly traffic and this traffic directly affect on your blog/website. So submit first your blog /website link to famous search engines. Like a Google, Bing & Yahoo, Ask, etc. This is a very small article, you can do many things to to Off page SEO but I just tell you mean this what you can do to high your page traffic very effective ways to Off Page SEO. So share your new ideas and your suggestion.